Week 1 of fishing league saw 38 walleyes come to the scale. 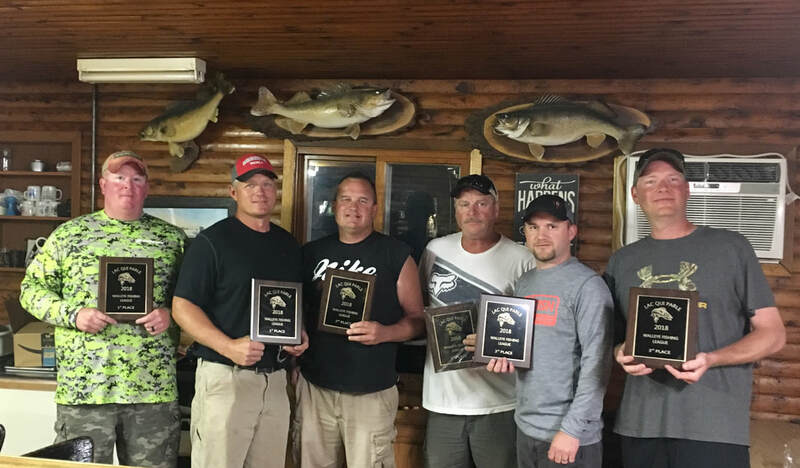 Dave Cornelius and Gary Roder took top honors with 5 fish caught for 16.9375 lbs. 2nd place went to Corey Joyce and (sub) Jeff Reuss with two fish for 12.3125 lbs, including the big walleye of the night, a 29", 11.25 lber. Third place went to Tony Malmquist and Aaron Heinrich with 3 fish for 8.9375 lbs. 4th place was Jon Jerve and Tony Ohmacht with 2 fish for 7.3125 lbs. 5th Place was Robb Gilkey and Nate Gilkey with 2 fish for 6.5 lbs. Rounding out the top 6 was Kelvin Weber and Sean Hauck with 2 fish for 6.0 lbs. Week 2 of fishing league produced 39 walleyes. Steve Dahle and Jamie Jahn took top honors with 2 fish caught for 17.875 lbs, including the big fish of the night a 28" weighing 9.875 lbs. Second Place went to Eric Spray and Adam Spray who weighed 4 fish for 11.875 lbs. Third Place was Tom Halvorson and Gage Halvorson who weighed 2 fish for 10.0625 lbs. Fourth Place went to Cody Enger and Sean Hauck who weighed 5 fish for 8.4375 lbs. Fifth Place went to Jason Prellwitz and Sam Thomas weighing in 4 fish for 7.125 lbs. Rounding out the top 6 was Pete McGinty and Shannon Larson who weighed 3 fish for 5.6875 lbs. Week 3 of fishing league produced 32 walleyes. Jerod Zimbelman and (sub) Tyler Struck took top honors with 4 fish caught for 11.8125 lbs, including the big fish of the night a 26.5" weighing 5.4375 lbs. Second Place went to Pete McGinty and Shannon Larson who weighed 5 fish for 10.8125lbs. Third Place was Trent Jorgenson and Matt Norby who weighed 5 fish for 9.625 lbs. Fourth Place went to Corey Reiffenberger and Jack Anderson who weighed 3 fish for 8.8125 lbs. Fifth Place went to Brent Zupan and Tom Ludvigson weighing in 3 fish for 8.1875 lbs. Rounding out the top 6 was Cody Enger and Sean Hauck who weighed 3 fish for 6.0 lbs. 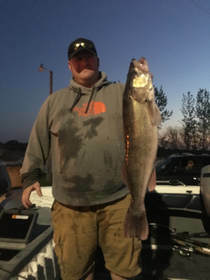 Week 4 of fishing league was a tough bite and only produced 11 walleyes. Josh Weckwerth and his son took top honors with 3 fish caught for 6.0lbs. Second Place went to Robb Gilkey and Nate Gilkey who weighed 2 fish for 5.125lbs. Third Place was Jack Anderson and Corey Reiffenberger who weighed 2 fish for 4.3125 lbs. Fourth Place went to Dean Broin and Jerod Zimbelman who weighed 1 fish for 3.8125 lbs and it was also the big fish of the night. Fifth Place went to Jon Jerve and Tony Omacht weighing in 1 fish for 3.625 lbs. Rounding out the top 6 was Sam Thomas and Jason Prellwitz who weighed 1 fish for 2.25 lbs. The struggle continues on Lac qui Parle Lake with fishermen dealing with extremely dirty water conditions. Week 5 of fishing league was a tough bite and only produced 3 walleyes. Brent Zupan and Tom Ludvigson took top honors with 1 fish caught for 4.0lbs. Second Place went to Corey Reiffenbeger and Jack Anderson who weighed 1 fish for 3.0625 lbs, they also collected the big fish pot as the first place team did not put in this week. Third Place was Pete McGinty and Shannon Larson who weighed 1 fish for 1.75 lbs. 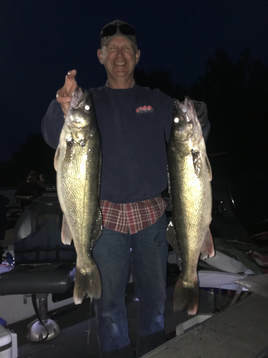 Week #6 of fishing league was a tough bite and only produced 8 walleyes. Pete McGinty and Shannon Larson took top honors with 5 fish caught for 9.0lbs. Second Place went to Tom Ludvigson and (sub) Mark Diller who weighed 1 fish for 5.1875 bs, they also collected the big fish pot. Third Place was Dave Cornelius and Gary Roder who weighed 1 fish for 1.9375 lbs. Fourth Place went to Jacob Wente and Brennen Longnecker who also weighed 1 fish for 1.625 lbs. Next week will be the final week of fishing league. Week #7 of fishing league proved to be another extremely tough bite. Dean Broin and Jerod Zimbelman took top honors with 2 fish for 2.8125 and big fish pot. Second Place went to Eric Spray and Adam Spray who weighed 1 fish for 1.75 lbs. Third Place was Steve Dahle and (sub) Mike Dahle who weighed 1 fish for 1.5625 lbs. That concludes this year's fishing league. This year's fishing league was definitely a tough bite for all anglers. Pete McGinty and Shannon Larson took 1st Place with 28.6875 lbs. Tom Ludvigson and Brent Zupan finished in 2nd Place with 22.5625 lbs. Eric and Adam Spray finished in 3rd Place with 20.625 lbs. Congratulations too the top three teams and to all the other teams who caught fished a tough bite for 7 weeks.